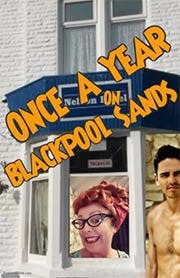 Set in Blackpool 1953 Not long After the Coronation, This Real-Life True Story is packed with Gritty Northern Comedy coupled with a Heart Breaking Emotional Punch. As Yorkshire Miners and secret lovers Eddy and Tommy Head to Blackpool with most of their Town for the annual Pit Close wakes holiday. However, Eddy had almost missed the bus and turned up with no suitcase covered in cuts and bruises. Now the lads have checked into the surprisingly empty Withering Heights on Sea guest House Run by the Caustic and Alarmingly Odd Gladys her rebellious and very flirty daughter Maureen and the infamous Red Ethel ex-communist stripper show girl. Up Stairs the only other guest Mr. Elbridge is trying to muster the courage to unleash any of his three female alter egos and walk the fabled Transvestite walk from north to south pier as a Woman. As Events unfold both heartbreaking and hysterically funny Six Lives will be changed forever and as Eddy reveals a shocking truth it will lead to a lifetime of activism in the fight for equality and freedom For the LGBTQ community.